The regulatory burden on physicians and others on the front lines of healthcare is intensifying. A new, comprehensive study echoes growing frustration with the amount of time providers spend pushing paper rather than treating patients. According to the Medical Group Management Association’s 2018 Survey, an overwhelming 86% of respondents reported an increase in regulatory burden over the past 12 months. An even larger percentage (94%) said a reduction in regulatory burden would allow more resources to be allocated toward patient care. The MGMA report is further evidence that regulatory overload has been mounting. Previously, the 2016 Jackson Healthcare Physician Trends Survey, revealed that 60% of physicians reported more administrative work under the Affordable Care Act, resulting in less time with patients. Medscape has reported that 57% of physicians spend more than 10 hours per week on paperwork, and numerous studies have found that administrative work contributes to physician stress and burnout. This burden comes with a cost. An analysis by the American Hospital Association shows that providers spend nearly $39 billion a year solely on administrative activities related to regulatory compliance. An average-sized hospital dedicates 59 full-time equivalents (FTEs) to regulatory compliance. one-quarter of those employees are physicians, nurses and other health professionals who would otherwise be caring for patients. The administrative overload makes the challenge of recruiting and retaining physicians more daunting. According to a recent survey, regulations are among the top causes of physician burnout. And, 54% said increased administrative burden contributes to the changes in healthcare that are likely to lead them to retire over the next five years. Seven out of 10 are unwilling to recommend healthcare as a profession, adding to the concerns of young people about entering medicine. Embrace the role of physician assistants and nurse practitioners in your practices. 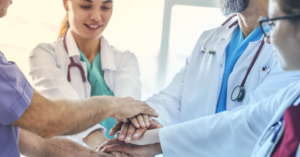 With healthcare representing the largest economic driver in many communities, administrators and trustees have access to their congressional representatives and the responsibility to place the issue of regulatory relief on the top of their agendas. As voters, everyone – administrators, providers, staff and patients – can make our voices heard at the ballot box. Take an opportunity to examine your congressional representatives’ position on these issues and support those who understand the severity of the burden and act on regulatory relief. While the wheels of government turn slowly, it is important to listen to physicians and other providers and manage those things under you control. Understanding their daily experience and frustrations will lead to solutions that maximize patient care time, ensure they are doing work “at the top of their license,” and encourage committed individuals to choose – and stay in – medicine as the satisfying profession it is meant to be. Contact us to explore how you can position your organization to find and keep physicians in a satisfying practice.